We provide a wide range of signage for businesses and individuals. For more information about our products, please select the signage category that best represents what you are looking for. Business signage includes outdoor signs, like panel, post, monument and marquee signs to indoor signs, like lobby signs, ADA signs, and more. Vehicle graphics includes any decals or graphics for cars, trucks, vans, or boats. We can create custom graphics for any type of vehicle. Trade show displays include Retractable Banners, Booth Backdrops, Table Top Displays, Logoed Table Covers, Table Runners and more. We have worked with many different businesses in various industries to create custom signage solutions for their needs. Here are some examples of industries that we’ve worked in and the types of signage that they usually need. Directing prospective buyers to your listings and giving them the information to contact you with inquiries is important for both residential real estate agents and commercial real estate agents. 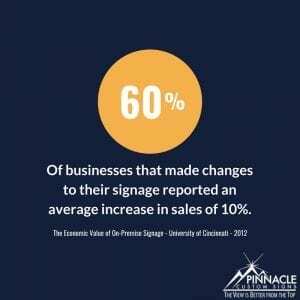 Learn how Pinnacle can help you with all of your signage needs. Educating the next generation of Americans is key to our future success as a nation. Signs play an under-rated role in that process. From directing new students where to go to building school pride and inspiring students, we can help you build a signage solution for any school, big or small. We know how important signage is to your business. They represent your brand and your image to your customers. From office signs to outdoor signs, vehicle graphics to trade show displays and more, Pinnacle Custom Signs provides you the expertise to create striking custom signs to bring attention to your business. Whether you are looking for something temporary – such as a banner announcing a great sale or a grand opening event or looking for something more permanent – like building signs, door lettering or architectural signs, you’ve come to the right place. Our team will take the time to make sure we understand your goals and your message, and we will ensure that these shine through in your new signs. We know how important it is to have the right business sign in the right location so that you can easily bring your customers right to your front doorstep. As a full-service sign company, we won’t stop at just producing an outstanding sign for your business; we also offer a variety of services to make us your only choice for all your signage needs. Why are signs important for your business? 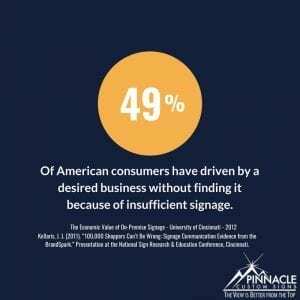 Signs can aid you in overcoming important business challenges, like promoting your products and services, making your location safe, and helping people find what they are looking for. Signage has an important part to play in your company’s daily operations. Signs help you build brand awareness. Branding is one of the most important parts of your business because it defines what makes your business unique and better than your competitors. Your branding is expressed in many ways, including through your physical signage, through your website and social media, through every conversation that your business has with someone; your branding is your guide. Branding is what makes a business strong. Think about the branding of companies like Coca-Cola. Their branding isn’t just build around the taste of their products but around the experience. Cool. Refreshing. Happiness. Friends. The Coca-Cola Polar Bears. You know the beverage when you see it, whether it’s because of the iconic red color or the Coca-Cola signature fonts. For the last 125+ years, Coca-Cola has built an incredibly strong brand that is recognized around the globe. Your business can build brand recognition in a variety of ways but it starts with creating a branding strategy and then adhering to that strategy with only careful changes made as necessary. We have worked with countless businesses helping them implement their branding in creative ways through signage, from vehicle graphics to monument signs to interior signage like logo signs and wall graphics. You can create a truly unique experience and look for your business that highlights and strengthens your branding. Signs can keep your employees and visitors safe. Wayfinding signs and compliance signs are often taken for granted and overlooked. These signs help people get to where they need to go (ie. bathroom signs) and avoid areas that are unsafe or restricted (ie. electrical rooms). Compliance signs can also refer to ADA signs – signs that include elements that helps those with visual impairment or other disabilities, like braille and raised letters. We work with businesses to map out their location to determine the best wayfinding system to put into place and what signs are required by law. This often includes designing custom directional signs and ADA signs that are effective, efficient and branded. Signs can create an experience that increases revenue. “A picture is worth a thousand words” – a sign incorporates words with colors, shapes, lighting, and textures to create a picture that conveys a message. A business can use a variety of sign types to create an experience for customers. For instance, a gym can use their branding guidelines to create outdoor signs that identify their location (name and logo) in addition to signage in their check-in area. Throughout the location, they can add motivational graphics of people working out or inspirational saying. If they have window space, they can advertise their current specials or services. Another example would be a law firm. Again, location signage is important for helping direct clients to your location as well as a logo sign in the lobby to reassure clients they are in the correct location. Glass doors or windows might use a frosted vinyl to provide privacy and create a clean professional environment. By creating a custom experience, you can more effectively engage with potential customers, informing them of details about your products and services. If you are interested in learning more about how our team can help you create a unique branded experience for your customers, please give us a call. 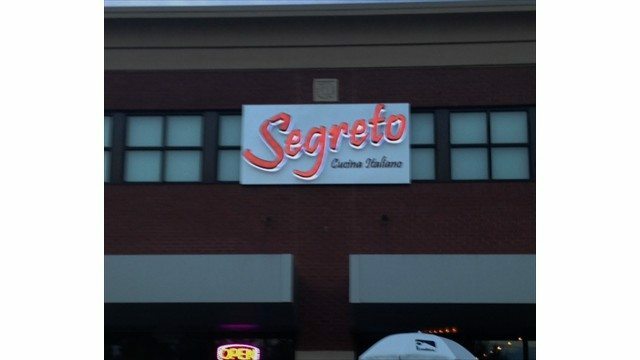 What services does a sign company provide? Why should I work with sign company near me? How to choose the right sign company? What if I need signage for my business locations across the US? Every sign company is different. Many will provide similar services and products. We can’t tell you what every company is like, but we can tell you what you should expect from us. When you contact us, you won’t be contacting a call center in India; you will be contacting one of our representatives in Buford, GA.
We’ll work with you to understand what your needs are and to schedule an on-site survey to further determine your needs and the requirements you are working with. After we have a full understanding of what your business needs, we will create a custom estimate for you. Often, we’ll give you multiple options depending on what solutions are available to meet your needs. Once you approve the estimate, a work order is created and work begins. Our team of graphic designers collect your branding material and desired sign design information; they will create a design proof so that you can see what the design will look like before production. At this stage, we will also research any jurisdiction regulations and gather information for any needed permits. Not all signs require permitting, but some local governments or the property owners may have guidelines that your signs must adhere to. Once complete, this information will be sent to you. If you approve the proof, a 50% deposit is collected in order to move into production. The next step is permitting, if necessary. It is very important that all of the necessary permits are filed and approved before production. While some local regulations may be easy to pass, others can be difficult. The amount of time this takes varies, and it can take several weeks. After the permitting stage is passed, we move into production. Most signs are done in-house by our sign experts. If we are dealing with specialty signs, we will work with a sign partner to get the necessary elements completed to our specifications. All signs must pass our quality assurance testing before we proceed to installation. We have installed signage both in our local area and nationally. After setting up a time for the installation, our team arranges for delivery and then installs the signs. Some signs may take a few days to put up; others will only take a few hours. On several occasions, we have designed, produced and installed signage on short notice, but timing depends on the type of sign being installed. After the signage is installed, final payment is due. We also take pictures of the before and after to post to our social media accounts. Your satisfaction is important to us. Getting the job done right and done well is important to us. Your business’s success is important to us. Sign companies will often provide a wide array of services that complement signs. Graphic designers with experience in signage design help businesses develop a sign design that matches their branding and meets the requirements for the type of sign being designed. This is easier said than done sometimes due to the requirements that must be followed. Local regulations or landlord/developer restrictions can limit the choices available for a sign, but our team has years of experience working within guidelines to create fantastic results. Permitting services is also another important service. A sign will do you no good if you are not allowed to install it. We have experience dealing with all sorts of local regulations and restrictions and will help you file the necessary permits to get a job done. Installation service is often overlooked because it is naturally included with most of our sign projects. However, we have been contracted by other sign companies to help them install signs that they have designed at a location local for us. Ongoing maintenance and repair is another important service for signs, particular outdoor signs. The weather, vehicles, and time – all of these things can damage outdoor signs in some fashion. We can help business owners by performing routine maintenance on their existing signage or come in when there has been some damage done. 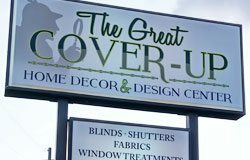 The choice to work with a local sign shop depends a good deal on what type of signage you are looking at and the talent in your local area. It also depends on your communication style. A local company generally has a better understanding of the local rules and regulations. A company from out of town will have to do more research but that doesn’t preclude them from being able to do the job. A local company may have lower costs because they don’t have to travel as far to complete the job. They may also be in a better position to do sign surveys and show you material options if you can easily meet in your area. You may not work with a local company if it is a specialized project or there isn’t an experienced sign company in your area. Or if you are doing vehicle wraps, you may not use a local company if you can find a company within reasonable driving distance who has more experience and/or better pricing. When working with a sign partner, you need to consider both your short term goals and long term goals. An ongoing working relationship with a sign company can give you the benefit of quicker turn arounds on projects and better brand consistency. To start, look at online reviews and ask for recommendations from other business owners who you trust. A company with a long history of happy customers with a few dissatisfied customers is better than a brand new company that only has a few reviews. Consider their qualifications. How much experience do they have with various types of signs? Working with a company that has national certifications, like a certified PDAA Certified Installer, can give you the peace of mind that the job will be done well and may give you extra protection in guarantees. When you have multiple locations or own a franchise business, it’s important to ensure that the branding is consistent everywhere. This can be tricky if the different locations have different requirements due to environment and local rules and regulations. It can also be difficult to get a consistent product produced if you use equipment in different locations; it’s better to produce all of the materials in one place and then ship to the location for installation. We have worked with a number of businesses with multiple locations who deal with these challenges. Often, they have a marketing company that comes up with the graphics which they give to us to find a way to implement. We are able to ensure that their branding stays consistent while helping them install signs across the country because of network of local sign shops. What custom signage does a business need? When are lighted signs beneficial for a business? Why are lobby signs important? What to consider when choosing the right outdoor signage? What signs does a store need? Your business’s physical location is a key part of your business. You need custom signs to direct individuals to your location and to identify your location. The type of business you run determines what types of signage you need for your business. 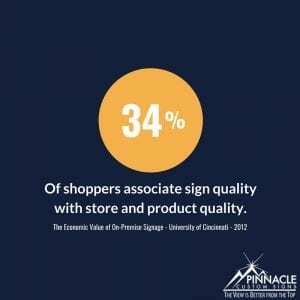 When considering what signs you will need, you will need to take into account your branding and how you can leverage your signs to engage potential customers/clients and promote your business. You also need to consider your location and the resources you have available. As we have already mentioned, your location may have local rules and guidelines for signs and you may be subject to additional rules from a landlord or developer. Understanding these guidelines will help refine your choices which can actually make designing a sign easier in way. The location that the sign will be may also be dependent on the resources available. If you need to have lighted sign, you’ll need a power source. If you need a roadside monument sign, you’ll want to consider the landscaping in the area. Even interior signs must often take into account factors like where power is, the line of sight of persons, and what is practical. You should also consider how to use signs to stand out. A sign that blends into the surroundings will get lost, but you don’t want a garish sign. Again, some developments may limit your choices by requiring a particular color or banning the use of certain colors or lighting techniques. Lastly, you should consider what materials to use. Metal signs can be expensive but high quality; however, you can achieve the same high quality look with other materials, like acrylic or aluminum. Talking with a sign maker will help you determine the best materials to use based on your requirements and your budget. 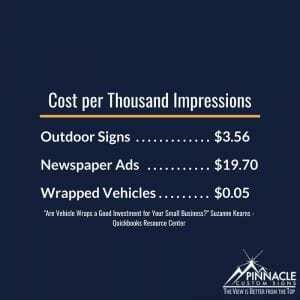 When done right, a custom sign can be a source of passive marketing for your business which will generate excellent returns on your investment. Here are some frequently asked questions about custom signs that we get asked. Every business is going to be slightly different when it comes to signage needs. However, there are some similarities. Unless you are located inside of an office park or mall, you are going to need outdoor signage to identify your location. This comes in several forms. Signs located at the side of road or in view of the road are key to helping drivers see your location and navigate to you. Building signs, or storefront signs, are important, particularly if you are located in a strip mall or near other buildings. Window graphics can also be very helpful if your storefront has windows; Vinyl decals can be used for displaying your logo, business name, and store hours on the front door. You can use custom graphics to promote specials or just add to the branding of your location. Interior signage can include lobby signs, directional signage, and other signs to inform customers and guide them to where they need to go. 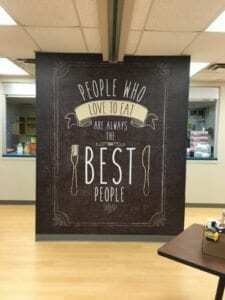 Wall graphics are also very popular because of its versatility; you can transform an entire wall with a mural or add a motivational quote, or so much more. It should also be noted that there are some signs that are required by law in order to protect individuals and to make areas readily accessible to all persons. These are often called ADA signs. Lighted signs are most beneficial for businesses that are located near busy roads and/or businesses that are open after sundown. A business that is located near a major road can benefit from keeping some lighted LED signs turned on because the signs are a form of passive marketing. By leaving your lighted sign on, you will be building brand recognition in the community even when your business doors are not open. You want to make sure, however, that you don’t leave lighted signs on that might indicate that you are open when you are not. This may result in you losing potential customers. You may also want to leave lights on if it will improve the security of your location. Some businesses choose to leave lights on inside of their building so that, if someone breaks in, they can be easily seen. Also, if the windows have window graphics, the interior light will make them easier to see. Lobby signs are often the focal point that draws the eyes of everyone who enters your office. This signs confirms to visitors that they are in the correct location and sets the tone for the rest of the office. It can be as simple as a vinyl wall graphic on the wall facing the front door or a sign mounted on the wall behind the receptionist’s desk. You can really be creative with logo signs because they are not exposed to the elements and often have much fewer restrictions. You can use wall graphics to make a background and then mount a dimensional sign using standoffs to create a layered look. Backlighting it would give it an extra wow factor. The possibilities are really endless when it comes to reception signs. Outdoor signs are important for helping individuals find your location. There are really two categories of outdoor signs – directional signs and building signs. 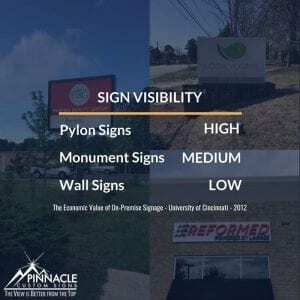 The most important things to consider when choosing the right type of sign is the local rules and regulations, your branding, how visible your location is, and the structure/area where the sign will be. The commonly used types of directional signs are monument signs which typically have the logo, name and street number; marquee signs which are often used when a business wants a message board or when there are multiple tenants in a building; and post-and-panel signs which are similar to monuments signs but not as permanent. These types of signs are used to create a wayfinding system. A wayfinding system is simply a collection of signs that help individual find their way. Building signs are attached to the front and/or side of a building. These signs can be lighted in a variety of different ways, including internal lighting via channel letters or a sign cabinet or external lighting that shines on to the front of the sign or lights it from behind, creating a halo effect. If you have a corner suite, or are located on the corner of two busy streets, having building signs on both the front and side are very beneficial. A retail establishment needs many of the same signs that an office or other type of business needs – marquee sign, building sign, and branding signs, but the key difference is in the need for temporary signs to advertise seasonal specials and promotions and the need for signs designed to designate a section of the store when minimal structures exist. For instance, we did a sign project for Good Deeds – a thrift superstore in Lilburn, GA. They needed a monument sign that allowed them to notify the public about special promotions going on. So we helped them design, create, and install a monument sign with a digital display board that they could update as needed. They also needed a way to designate where the different departments (ie. Men’s, Women’s, Furniture) were located in the large open layout of the store. We accomplished this with special hanging signs that were lightweight, easy to install, and can easily be moved later if needed. We also used wall graphics when possible, like with the Furniture department. 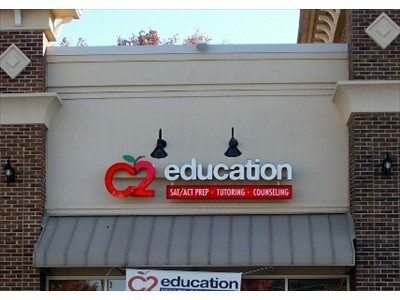 This is one example of several jobs we’ve done for businesses in Georgia and throughout the United States. If you are in need of retail signs for your business, please give us a call for a free quote. What type of vinyl graphics should I use? Are custom decals worth it? What vehicles can be vinyl graphics be used on? Who should I trust with my vehicle branding? 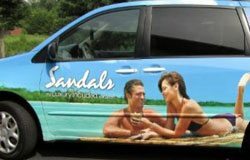 What is the most effective use of car graphics? Vehicle wraps are one of the most effective and most popular forms of advertising for businesses, particular for service based businesses. Wraps can be as simple as some vinyl graphics for the side of a work van to designate the company and the basic contact information. 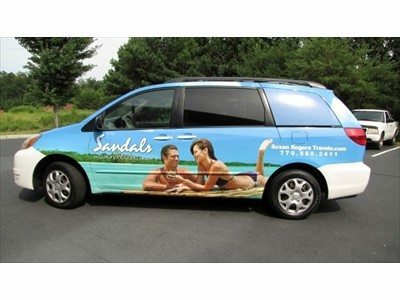 Or it can be a full vehicle wrap with a lot of details. You can even use a vinyl wrap to change the color of your personal car and give it added protection! One of the most important things to remember when considering vehicle graphics is the design and keeping the design simple and smart. Drivers often only have seconds to take in information so you need to get your message across easily. Depending on your budget and your goals, you may consider anything from simple vinyl lettering to a full wrap. Many businesses who are on a budget or who have service vehicles that might change more frequently over time, choose to use vinyl lettering. It allows you to to put the logo/company name and basic contact information on a vehicle’s side and back for about $500, depending on the size and other factors. You can go for a bit more exposure by increasing the size of the graphics, adding images and more colors. This usually is considered a partial car wrap and costs $1000+, again, depending on the design you choose. A full wrap can cost $2500+. Don’t let these prices turn you off from getting a wrap. The return on an investment in car graphics is often well worth the upfront cost, especially when you consider how long they typically last. If you are interested in getting graphics for your vehicle(s), please give us a call for a free quote. We can give you a price quote on exactly what you want so you know what your budget is. Custom decals and graphics for vehicles is one of the most active segments in the sign industry. Service providers, like air conditioning companies, pest control companies, and so many others, are finding that the return on investment for vehicle graphics is incredibly profitable. Think about it this way, everywhere you drive your vehicle, you are getting your brand in front of thousands of people. The more someone is exposed to your brand, the more likely they are to think of you next time they need your services. This is especially true if your branding is strong. 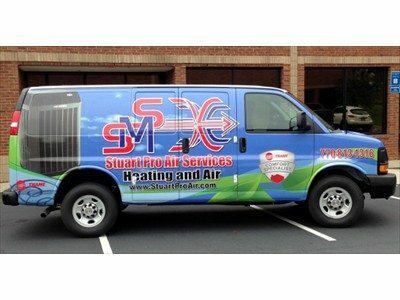 For instance, Stuart Pro air conditioning in Georgia has created a consistent brand image for their van wraps, truck wraps and car wraps. Their clear branding means that people are more likely to be able to recognize who they are and what they do no matter which type of vehicle they are driving. Vehicle graphics can be used on passenger cars, trucks, vans, box trucks, boats, golf carts, airplanes, motorcycles, ATV, bicycles… you get the idea. The type of vehicle wrap film that is used and the limitations of the design are dependent on the vehicle. A light use, passenger car could use a less durable vinyl while a heavy duty work truck is going to need a heavy-duty vinyl. While many businesses use the traditional car, truck, or van for their business, we have also wrapped some less traditional vehicles. Boat wraps are popular for avid boaters, particularly professional fishermen who want to display their boat’s name and sponsors on the boat. Golf carts and other smaller vehicles used for some businesses can be wrapped with graphics. Some individuals who want to change the color of their vehicle, be it their car, motorcycle, etc., choose to do so using vinyl wraps because of the incredible variety available – metallic colors, design, and added protection that it just isn’t cost effective to accomplish with traditional paint. When looking for a sign shop to trust with your car wraps, there are several things you want to look for. First, you want to find a location that is relatively close to you. Vehicles are great because you can choose a sign company that is several hours away from you without having a significant added cost for travel. On the other hand, you may want a local company if you anticipate making changes to the graphics frequently. To start, google “car wraps near me” and see what companies come up. Check their reviews – both how many, how good, and how recent the reviews are. Next, look up each company’s credentials. Many of the major suppliers of vinyl wraps in the industry, like Avery and 3M, have specialty certifications that installers can get to prove they have the skills necessary to get the job done well. Once you’ve narrowed down your list, talk to the companies. Ask for quotes. Look at their past work to see if you like what they have done. Chances are, you’ll be building a long term relationship with the company you choose, so make sure you pick a good company. Using car graphics to your advantage involves creating a solid plan to begin with. You should have a branding guidelines for your business that includes high resolution copies of your logo, the colors of your brand for both web and print use, tag lines, mission statements, vision statements, etc. These guidelines will help you keep focused when creating a design. Next, you need to have a clear goal – what do you want to accomplish with the vehicle wraps? Do you want more phone calls? More brand recognition? Keep these goals in mind when going into graphic design phase. It’s easy to get caught up in making a “cool” “wow-factor” design and lose sight of the goals. When it comes to designing your car graphic to be the most effective, you need to think about placement. We often recommend that businesses pay extra special attention to the back of their vehicles. Window graphics on the back of a vehicle are seen for a longer period of time than the side of a vehicle (particularly if you get caught in the Atlanta rush hour traffic). The best way to maximize your vehicle advertising is to work with an experienced sign shop. We have years of experience working with big company fleets and individual vehicles for businesses. Contact us today to get a free quote and talk with one of our vehicle experts. What kind of banner stands are needed? Do you create banners for just businesses? If you are on a tight timeline or budget, custom vinyl banners is a great option for you. Banners are easy to print and are one of the quickest, smartest ways to get your message in front of people. Banners are most often used when a permanent sign is not feasible. This could be because the permanent sign is being built but requires more time. Or it could be that the message of the banner is time-sensitive and is not permanent – like a special sale or a special event. Depending on your intended use for the banner and its location, the size and the material used will differ. 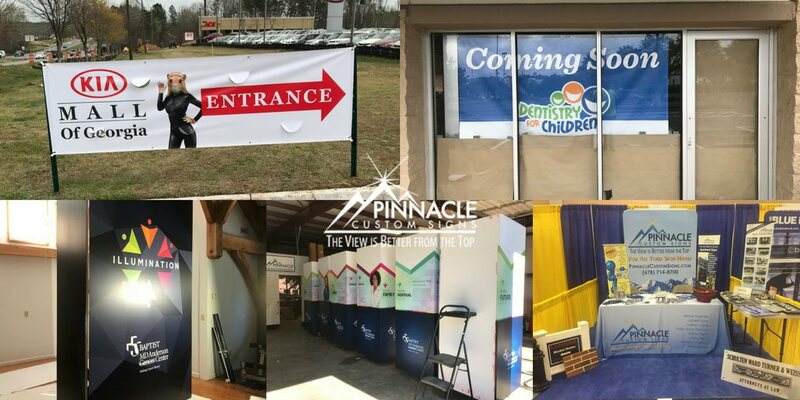 At Pinnacle Custom Signs, we are able to print banners as large as 60 inches by 150 feet in-house and even bigger ones through a preferred partner. No job is too big for us! Here are some frequently asked questions about vinyl banners. Banners are made out of a base material that is coated with a lightweight PVC base coat to allow for easy printing. Outdoor banners are often made of a material called scrim which is a fine mesh grid of polyester fibers. 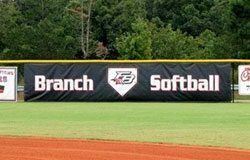 For more durable banners, a thicker mesh is used and additional reinforcements can be added, like reinforced corners and hems. Indoor banners are typically made of a canvas, cotton-based material. These fabric banners should not be used outdoors or in moist conditions as the cotton can get wet which may compromise the banner. There are several other types of material that can be used depending on the banner’s application, like with retractable banners and anti-curl banners. Any of the banners can be printed in full color which allows for unlimited text and graphics. The best way to know how much it will cost is to talk with your sign company about your project. Banners come in all shapes and sizes and are used for a variety of purposes. To determine what kind of banner stand you will need, you need to consider how you are using the banner. If you are using a banner to advertise an upcoming event, like a Grand Opening or School Event, you may be using roadside banners. It’s possible that when your monument sign or building sign was designed that there was a special place created to hang banners on the sign. If not, a simple in-ground frame can be erected in the area near the monument sign. If you are using the banner indoors, you might use a retractable banner stand or a simple x-frame banner stand. You may also be able to use a hanging banner on a wall or from the ceiling using anchor points to keep the banner taut. When talking with your sign shop during the design process, be sure to talk about how you will be displaying the banner so that you can factor in any additional costs for stands. We have a large digital printer than can print in full color on banners as long as 150 feet and as wide as 5 feet. If you need a banner larger than this, we can work with a preferred partner who specialize is large banner creation to produce the banner. For long-term durability and design pop, we recommend digital banner printing. The material that outdoor banners use makes them very durable in all types of weather. Talk with your sign partners about the location that you are placing your sign and how you will be placing it. These factors will come into play with what materials are used. A banner that will be placed using an in-ground frame or post frame will need to be thicker and more durable because of the potential for heavy winds during storms. If that same banner were attached to a monument sign or the side of a building, it may not need to be as durable because it will be somewhat protected by the structure it’s affixed to. If a banner is placed in full sunlight for most of the day, it will be damaged by UV radiation. If your sign company knows this, they can recommend the best ink and material for the circumstances. No! We create banners for churches, schools, businesses, and private individuals all of the time. Most of our banner projects are for businesses but we have a good number of church banner and school banner projects that we work on. How can retractable banners help me? How do you to design a trade show booth? Many businesses rely on trade shows to market their business and to learn about new business opportunities and partners. Having a well designed trade show booth is very important in making a good impress, particularly when there are hundreds of other vendors at an expo. We work with businesses to plan out their trade show booth from the ground up. 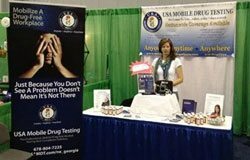 Our specialties are creating custom backdrops, retractable banners, table displays, and other unique displays for trade shows and expos. Whether your needs are simple or if you have the need for a custom setup, we can help! If you have ever had a booth at a trade show, you understand how much work goes into setting up and running a booth. Hauling in all of the display backdrops, banners, promotional materials, etc. can be a lot. Oftentimes, venues will only give you a specific amount of time to unload and setup so that every booth has time to set up before the trade show. Retractable banners make setup easy. Banners are quickly setup or packed up in moments and the banner remains protected inside of the case. These banners are easily customizable and can be very large or fairly small – it all depends on your needs. You start with two things – your branding and your goal for the trade show. If your goal is to get people to sign up for specific product demo, then you will design your booth around that. Your branding will act as a guideline for that design to ensure that, no matter what, you are promoting your company and building brand awareness. Some businesses have a specific design in mind and just need help making it happen. That is great! We have worked with several businesses who came to use with an idea but didn’t know how to make it happen. Together, we brainstormed different ways to make it happen and priced it out. The end result was a unique trade show exhibit that made a big impression. 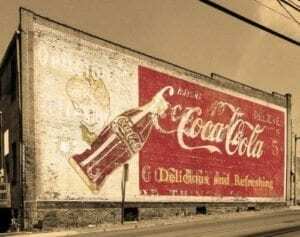 Many of us have seen old Coca-Cola signs painted on downtown buildings in the historic districts of places we love to visit in Atlanta. These scenic trips in time are often referred to as murals or hand-painted artwork on the side of the buildings. However, not many years ago these were branded advertising strategies by companies to promote their products. Fast forward to 2016 and you will find that companies are still using this strategy but it comes in the form of digitally printed images specifically applied to walls. 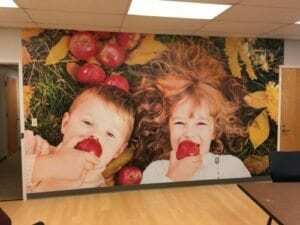 Wall Graphics come in various forms but the most common way to create a wall graphic is by using wall-graphic media that is treated with adhesive-back vinyl. The recent improvements over the years have allowed for us to install vinyl-based, printed wall graphics that are easily installed both indoors and outdoors. Other options include wallpaper style graphics that are printed on a similar material as traditional wallpaper and then applied with adhesive. Retailers and Shopping Centers often us these type of sign graphics because they can be installed and replaced repetitively by professionals throughout the course of different seasons. Creativity – You can be as creative as you want to be with a digital printing and can reproduce photo images in your artwork. The sky is usually the limit in choosing the elements of the graphic. Inspiration– Many companies today use digital wall graphics to boost staff morale or inspire clients who enter their work space with motivational quotes or targeted messaging. Impact– Often a digital graphic can add extra added impact to an existing interior or exterior sign by drawing the eye to the target area. Marketing– Digitally printed graphics can help you show off products to impress prospective clients before you ever sit down to talk. Redesign– With 20th-century technology graphics can be a creative way to refresh the look of your office without having to repaint or remodel by creating an extra dimension to your work-space through the graphics and brightening the overall appearance. A digital sign can be as big as your entire wall space or as small as decals next to your door, but in either case signs such as wall graphics can add an extra touch to your presentation. Check out our photo gallery for inspiration on how to use wall graphics or stop by the office and see our own collection in our front lobby. We don’t just promote wall graphics, we use them ourselves in our office. If you would like more information about digitally printed signs or wall graphics or would like a free consultation about how to best use graphics to enhance your space — Give us a call!